If you don't have time to read my entire review, base your decision on whether to read The False Prince on this paragraph. After I read the last word on the last page, I set the book in front of my husband and said "Read this. Now." Not a request. A command. As the smart boy does in most circumstances, he immediately complied and loved the book. My copy of The False Prince was from the library. I waited until the last moment to return the book, re-reading favorite passages multiple times. Before I reluctantly slid it into the return slot at the library, I literally kissed the book goodbye. Since that time, I've bought an e-copy of the book and re-read it. I also bought a physical copy for my parents which I'll take back when they finish it. The book is that good! The False Prince may be my favorite read of 2012 thus far. It is one of my favorite boy fantasy adventure stories since Harry Potter. What sets the book apart? The protagonist of The False Prince is an incredible character. He could talk the money right out of your pocket and into his and then convince you that you wanted to give him the cash. Sage always gets the last word - usually a sarcastic one. Because of Sage, The False Prince has some of the best dialogue I've read in a long time. Sage is supremely self-confident. Or where he's not, he easily fakes it (a skill I would desperately love to acquire). He is accustomed to being the smartest person in the room and carries himself that way. It would be easy for such a person to be boastful, arrogant, reckless, and condescending, but Sage isn't. He has a strong underpinning of decency. He is an excellent judge of character - sensing who is inherently good or bad. He does not suffer fools easily. Sage is a candidate prince alongside Roden and Tobias. The dynamic between them is fascinating. They are comrades in arms, experiences the same trials, united against the same "enemy." Yet they are also rivals - in a game where the stakes are as high as they get. All three want to win. In their own way, each works to undermine the other two. The three act as a team sometimes, while two gain up against one at others. I love how complicated Roden and Tobias's personalities were. Each was capable of desperate cruelty, yet I couldn't dislike them completely. Sage's interaction with Roden and Tobias highlights his charisma and intelligence. The False Prince is an action filled novel. Every chapter Sage is getting into trouble, getting out of trouble, or going on some dangerous adventure. The book never drags. At the same time, it doesn't feel like you're reading a bunch of disjointed action scenes. The plot flows well. Through the action scenes, the story moves from point A to point B. After a few chapter, you discover that you understand the characters really well. Not because you've been told that their personality is X or Y, but because you've been shown. Ms. Nielsen actually achieves the show not tell goal that so few authors do. I was quite surprised by the direction of the plot, but even if you're not, the exact journey will keep you on your toes. I particularly like that the plot is appropriate for middle grade readers, but is mature enough that it can be enjoyed by adults. It has universal appeal. While it does not contain any swear words or romance, it doesn't feel juvenile. It does have a surprisingly amount of violence and cruelty. It feels appropriate given the plot and is never graphic, but it's not sugar coated for a younger audience. The best books have something indescribable that sets them apart. The False Prince just feels right. Sage immediately feels like an old friend - or a friend you'd really like to have. It's impossible not to get invested in his plight - can he be chosen as the imposter prince? What happens if he is chosen? What happens if he isn't? What's even better is that the book improves on a second read. The book is enjoyable on a surface level, but there are tons of little details that only become clear once you've read the entire story. It doesn't have the complexity of the Harry Potter series, but Sage has a stronger, funnier personality than Harry. As much as I love Harry, if I had to choose between going out to eat with Harry or Sage, I think I'd have more fun with Sage. 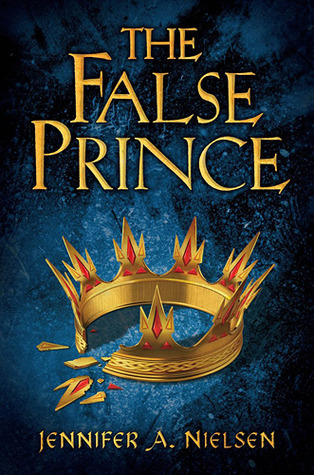 As much as I'd like to say that The False Prince is a flawless book, it's not. The world building is lacking. We know very little about the kingdom that Sage lives in. We get little details about different countries and the basic history, but much is lacking. It's harder to put the political crisis into context when you only have partial background knowledge. This may be rectified in future books in the series, but I still think more should have been introduced in the first book. Also, there's a point late in the book where the tense shifts from first person to third person. I understand why it was done, but it's still choppy. I'm not sure how the plot development could have been handled better, but I would have preferred something other than the jarring change. The few problems that The False Prince has were minor. They in no way effected my enjoyment of the book. Few books are perfect and I imagine that each book in this series will get better and better. I can't recommend The False Prince highly enough. It is an entertaining, hilarious, seat of your pants read for all ages. In a world crowded with fantasy adventure series, The False Prince stands out for its fabulous dialogue, enchanting protagonist, and well developed plot. Holy Awesome? That good hu???? I have a copy which I got at BEA and now... I cannot wait to get my fingers on this one! I expected it to be good, but you loving it that much? I'd say it's a cross between MG and YA. Appropriate for MG but just as good for YA. I've been wanting to read this book for quite a while now, so I'm glad you loved it! I was hoping for a little romance or something . . . so guess I should just wait and see until I come to read it. Great review btw! There's really no romance. But I think there will be in future issues. Probably like in Harry Potter - where romance is a subplot but never the main focus. Which is good especially for boy readers. Wow Alison, clearly I'm missing out by not reading this one! Any book you kiss goodbye before returning it to the library is one I need to read. Despite the lack of world building and the strange tense shift, it sounds absolutely brilliant and I want to meet Sage immediately. Gorgeous review! Oh I loved this too! I feel like this is the book that nobody was talking about that came out of nowhere for me. I absolutely loved it as much as you did though! This was a book that came at exactly the right time for me when I'd needed just the kind of book that had humor, mystery and romance all into one. Fantastic review, Alison! I totally LOL'd when you said you got the book for your parents, but you would take it back after reading. I do that all the time. Gift books to people, then secretly plan to get them back. Terrific review! I already have this one on my tbr after I read Small's gushing review. Looks like I need to bump this one higher on my list to read. I literally just finished reading that book last night. :D It was an awesome read, and I agree on all of your points. Sage is up there on my list of favorite book characters, even if that little third-person narrative broke up the reading a little at the end. Great review, I totally agree about the awesome-ness of this book! Thanks for the review! I've been wanting to read this book, but was a little bit iffy about how much I may like it. I'm glad that you loved it, though, because I'll definitely give it a try now! I love the way you made this book sound. Just by your review alone, its commmanding me to read it. Awesome review! Wow, you rarely give 5 stars to any book that I've seen! I guess I underestimated this book because it doesn't seem to be catching people's interest all that much. I'm going to seriously consider getting this one. Thanks for the review! I have this book sitting on my kindle as we speak. I ordered it awhile back and it sits on the kindle shelf crying at me to read it... After reading your review I'll have to read it! Oh boy. It's official: this will be the next book I buy. The faults you mentioned just seem so minor when compared to all the glowing things you had to say about it. Sage! I hope to meet him soon. I really loved how thoughtful and balanced your review was! I think it explains very well why we tend to love and rave about books that aren't perfect. This is probably one of my favourite books of the year as well and I absolutely love your review of it! You pretty much hit the nail on the head. The name of the MC is Sage??? Okay I'm sold. LOL I like characters with cool names. I've also heard sooo many positive reviews about this so really, I was sold even before I read this review. I'm also excited to read about their adventures AND the bromance! I like my YA with romance but I love it when there's bromance! Thanks for the review!